After reading the first book, Rot & Ruin, I had to know what happens next. 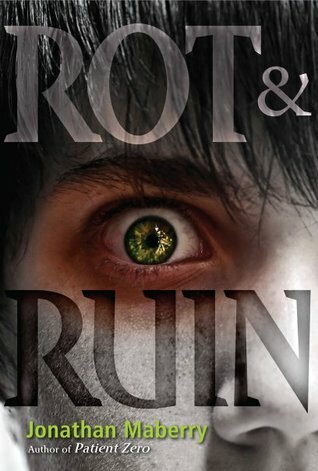 Warning this review contains spoilers for Rot & Ruin. Now, after months of rigorous training with Tom, Benny's zombie-hunter brother, Benny, Nix, Lilah the Lost Girl, and Chong are ready to leave their home forever and search for a better future. But from the start, everything goes wrong. They are pursues by the living dead, wild animals, and insane murderers, and are faced with the horrors of a rebuilt Gameland, where teenagers are forced to fight for their lives in the zombie pits. Worst of all...could the evil Charlie Pink-eye still be alive? I chose to read this book because the zombie craze is still going strong and I have not gotten into it yet. I haven't read anything or watched TV shows zombie related. I have watched numerous movies. I thought this book would be a good introduction to zombie lit. In the zombie-infested world Benny has grown up in, teenagers must work once they turn fifteen-or they’ll lose their food rations. Benny isn’t interested in taking on the family business, but he reluctantly agrees to train as a zombie killer with his boring big brother, Tom. He expects a dull job, whacking zombies for cash. What he discovers is a vocation that will teach him what it really means to be human. As his worldview is challenged again and again by the lessons he learns from Tom, Benny is forced to confront another horrifying reality: Sometimes the most terrible monsters are human. One of our readers had recommended this book to me some time ago. He warned me that is was “zombie lit”, which made me hesitant to read it. Before beginning this novel I had read The Forest of Hands and Teeth, and was extremely unsettled. While that probably wasn’t my best jump into zombie lit, I figured I would give it one more try.